Thought you might be interested in this fairly early stereo view of Scutari hospital – which is difficult to date precisely, but was probably still being produced until the mid to late 1860s. I hasten to add that I am not the seller and have no vested interest in this sale (which is hardly high end anyway!). I was simply impressed by your researches into the battlefield sites etc. and thought this might be relevant. This ‘syphilis’ anecdote, unsupported by any evidence and incompatible with all medical knowledge, circulates widely in North America. It was invented by a bishop at a Convention of the American Episcopal Church in 2000 who was opposing a resolution to add Nightingale to that Church’s list of ‘lesser saints’. (Nightingale was a religious heretic who maintained that Jesus Christ was not divine.) 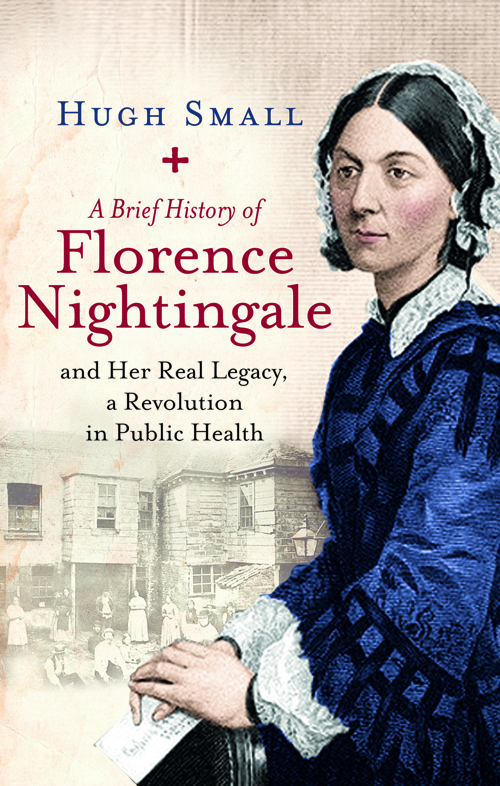 Her biographer Lynn McDonald traced the syphilis story to its roots in “Florence Nightingale: An Introduction to Her Life & Family (The Collected Works of Florence Nightingale, Volume 1, p. 465). 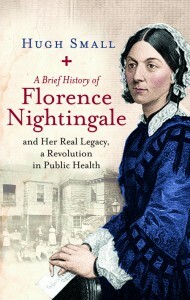 Everything else that is widely ‘known’ about Florence Nightingale is also wrong. That’s what compelled me to write my biography. Hugh, I have just finished reading your ‘Brief History’. I’m impressed, I think your case for FN as a major mover and shaker in the field of public health is unassailable. 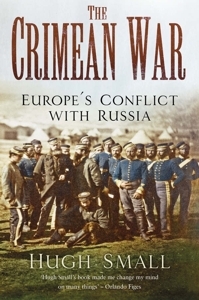 I do wonder though whether her post-Crimea breakdown was really triggered by her realisation of the high death rate at Scutari – when she must have been aware of this already and when she and her nurses – through applying sanitarian principles – had moved matters a long way in the right direction over the winter of 1854-55 after their arrival – and had done so much more besides to improve their patients’ lot. What more could they have done?! Contrary to what you suggest too, it is claimed by other authors that the men sent to Scutari – often to die – were in fact worst cases, the persistent fever cases, so that unadjusted statistical comparison with those retained elsewhere may be invalid. Of some interest: what were the sickness / death rates amongst Florence’s nurses – and amongst the hospital orderlies? Viewing her later career, you sadly underplay the roles of her brother-in-law Harry Verney and his son Edmund in promoting and assisting her reforming initiatives – in and out of Parliament. If you have not already done so, you may be interested sometime to visit Claydon House in Buckinghamshire (Open to the public through the National Trust) to view the rooms she periodically occupied there, as a guest of the Verneys, and other memorabilia. 1. You say Nightingale was aware of the high death rate during the war. That’s true – but until William Farr helped her to analyse the statistics after the war she attributed this high death rate, not to hospital sanitation, but to starvation and ill-treatment at the front and delayed hospitalisation. My book quotes previously unpublished letters in which she made this diagnosis. Her realisation after the war was not that the death rate had been high but that her much-touted diagnosis had been mistaken and that lives could have been saved by relatively simple sanitary improvements. 2. You say she ‘moved matters a long way in the right direction (of sanitation)’ during the war. The conventional wisdom used to be (based on the 1920 Dictionary of National Biography) that she asked the government to send out a Sanitary Commission to Scutari. My research showed that there was no evidence to support this in the countless letters she sent to the government asking for help with various problems. Other historians now agree with me that the Sanitary Commission (which she later claimed ‘saved the army’) was not her idea. 4. You say it is claimed by other authors that the men sent to Scutari were the worst cases ‘the persistent fever cases’. If true, I think there would be a record of this, and I am not aware that any author has produced any evidence. Nightingale did not believe it, and wrote explaining how the high mortality on her watch had been ‘‘due to the frightful state of the Hospitals at Scutari” (p. 202). She may have been mistaken (other authors have claimed that, too) but my point is that she was emotionally affected by her belief and acted on it when fighting successfully for a sanitary revolution at home. So, if she was mistaken, it was Britain’s great fortune that she was. 5. You say I sadly neglect the Verneys. My book makes it clear (p. 172) that Nightingale’s brother-in-law Sir Harry Verney played a crucial role in persuading the cabinet minister responsible to introduce Nightingale’s revolutionary clauses in the Public Health Bill. However, I agree that there is not so much about her relatives in my book as in other biographies. Because in your book you say rather little about (a) what FN & her nurses actually did at Scutari day-to-day and (b) what her patients actually died of, I went searching on my own account – you see, you piqued my interest – the mark of a good author! Center for International Health, Department of International Health, Boston University School of Public Health, Boston, Massachusetts – https://academic.oup.com/cid/article-abstract/40/12/1799/314039. into the Turkish markets to buy back the purloined goods. etc. – but you can read the entire paper for yourself. And it includes a long list of references. 3) Because cleansing the wards of human waste, getting excreta as far as the sewers such as they were, could not make a great deal of difference if the water supply was contaminated – as it surely was. Remember again, no-one yet knew, although some suspected, that enteric disease were – or could be – water-borne. 4) Because the spread of respiratory diseases – particularly so if these included influenza – must be impossible in a crowded hospital unless affected patients were meticulously isolated – and perhaps not even then. Why did matters improve in the spring, after the arrival of the sanitary commission? 3) Because the Sanitary Commission took the kind of radical action which had beyond FN’s power. If she blamed herself, she certainly did so mistakenly. She was of course correct in looking beyond nursing care to basic sanitary improvements as the ultimate solution to the problems she had faced. But I am inclined to wonder whether after the stress and horrors of Scutari, the correct diagnosis of her breakdown may have been PTSD. Perhaps too a broken love-affair? Christopher and Gillian Gill, in the passage quoted above, make a number of claims about what happened in the Scutari Hospitals but quote no documentary evidence to support any of them. In my biography of Nightingale I reference contemporary documents for each of the facts so that the reader can distinguish between opinion, speculation, and evidence. ‘The Sanitary Commission smashed 400 window panes with their own hands on their second day at Scutari’. (For my sins!) I am a volunteer guide for the National Trust at Claydon House. Today I took a close look at two relevant prints we have there of the hospital at Scutari: one a distant view, over the cemetery (!) the other of a ward. In the distant view the hospital appears to have about 90 windows per floor on the side shown – in 30 groups of 3 – and 3 main floors, with extra floors and windows in the corner towers, which I discount. Assuming – as appears – that this was a square building, all of that can be multiplied by 4 for the total number of external windows. There was a central courtyard. Presumably the window arrangements over that courtyard were similar – but because the internal sides must be shorter there must be less widows. I cautiously suggest 18 sets of three per side per floor internally. Taking the hospital entire (excluding the corner towers) that totals 576 sets of 3: 1728 windows. The ward print clearly shows that each window comprised 3 panes, arranged vertically, divided by glazing bars. Incidentally two of six windows visible in the print are visibly open, the lower 2 panes open on a vertical hinge, the upper apparently fixed-closed. No pane shown is broken. Possibly others of the total of 6 windows (18 panes) in this ward are also open – or openable – but the angle of view in an otherwise very clear depiction is such that this cannot be certain. Total panes in the entire hospital (again, excluding corner towers) = 1728 x 3 = 5184, of which if this ward view is typical – but that cannot be certain – at least 1152 were sooner or later openable (and possibly every lower pair of panes in every window was openable!) – but whether as a matter of deign before FN arrived, or later thanks to her efforts or later still thanks the the Sanitary Commission’s efforts, cannot be deduced from the prints. But at best, 400 windows – presumably panes – broken by the Commission = no better than an 8% improvement in ventilation – and if some windows were openable in any case, somewhat less.